Driving around Toronto can be quite the hassle these days, and with the city just getting busier, various infrastructure projects are working to improve the way we move around the city. The Union-Pearson Express (UPX) is Metrolinx’s answer to improving access to Pearson Airport from the central city right now, set to open in the Spring of 2015. The first two low emission Nippon Sharyo diesel multiple unit trains for the line recently arrived in Toronto after a long trip from their manufacturing facility in Toyohashi, Japan. 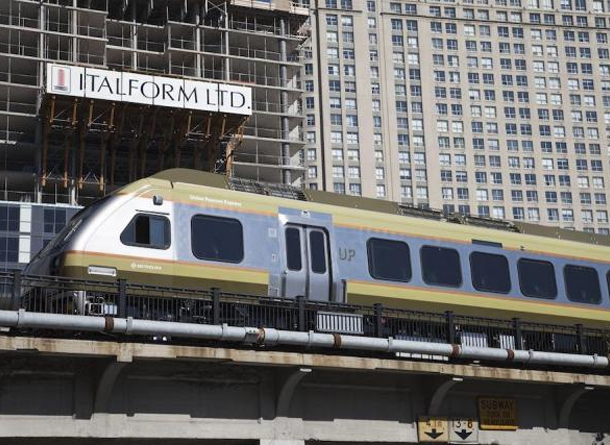 The trains, two cars long currently but to be extended by the addition of a middle car in December, are now being tested on the Lakeshore, Kitchener, and Barrie GO rail lines. You may spot them along those tracks in coming months; we caught one today just outside of Union Station.